The findings of Andrews' study on 120 nonorthodontic models served as the foundation for the development of the straight-wire appliance. This started the era of preadjusted edgewise appliances. Since the introduction of the preadjusted edgewise appliance, it has been extensively used all over the world, including in India. In pre-vedic times, India was inhabited by a short-statured, brown-skinned people, descendants of the Iberian race of Caucasians called the Dravidians. About 300 AD, Aryans, descendants of the Nordic group of Caucasians, invaded the Northern part of India, displacing the Dravidians to South. Today, North Indians are generally tall fair-skinned people of Aryan origin, whereas South Indians are a darker-skinned people with Dravidian characteristics. There is a need to establish the norms for crown angulations and crown inclinations in the local population and to find out if they are comparable or in variance with the norms established by Andrews, which forms the basis of the bracket prescription of most preadjusted edgewise appliance systems. The present study was carried out to assess crown angulations and crown inclinations in subjects from Davangere, South India, and to compare the obtained data with that of the original values of Andrews. Also, we wished to evaluate the tooth size discrepancies in this population. Five hundred subjects, native to Davangere, South India, were screened by a panel of judges that comprised two orthodontists, a lay person, and one oral surgeon. One hundred subjects (50 male and 50 female) who fulfilled the selection criteria were selected from the total sample of 500. The selection criteria were comparable with those used by Andrews  [Table 1]. Alginate impressions of these 100 subjects (50 males, 50 female) were made for both maxillary and mandibular arches and study models were prepared. Bolton analysis was used to determine disproportion in size between maxillary and mandibular teeth in all these 100 subjects. The determination of tooth size discrepancy was made according to the method described by Bolton. The mean (with standard deviation), median, and range were calculated for both overall '12' ratio and anterior '6' ratio. The facial axis of the clinical crown (FACC) and its mid-point, the facial axis point (FA point), were marked on each crown of each dental cast. The FACC represents the most prominent portion of the central lobe on the facial surface of each crown; for molars, it represents the buccal groove that separates the two large facial cusps. The FA point was marked as the midpoint of FACC. The FACC served as the reference line from which crown angulation and inclination were measured. On the duplicated casts, the occlusal half of each crown was trimmed out. The mean, standard deviation, and standard error were calculated for crown angulations and inclination using the software EpiStat; (EpiStat, Round Rock, TX). To rule out inter-operator errors of measurement, 10% of the total sample was randomly selected and measurements were made by two independent workers. Measurements were presented as mean±SD and range. The 95% confidence limits were calculated for each tooth separately and are presented along with the mean and standard deviation. Positive maxillary angulation values were obtained for all teeth; however, incisors, canines, and premolars were less angulated in our study subjects than in Andrews's sample, while molars had similar angulation as in Andrews' sample. Mandibular incisors and canines were less angulated, whereas premolars and molars had the same angulation as in Andrews' sample. Among maxillary teeth, the mean crown angulation was highest in the lateral incisors and canines, while both premolars had the lowest value. In the mandibular teeth, incisors had least crown angulation and the canines showed the highest crown angulation [Table 2]. Increased maxillary positive crown inclination values were obtained for both central and lateral incisors, the central being twice as inclined as the lateral. The canines' inclination values were similar to that reported by Andrews. Premolars and molars showed increased negative inclination. In the mandibular teeth, incisors showed increased negative inclination. Mandibular canines, premolars, and molars were less inclined than in Andrews' sample. Among the maxillary teeth, the central and lateral incisors showed positive crown inclination of 16.68±0.6° and 8.93±0.73° respectively, while the first and second molars had more of negative inclination of −14.78±0.7° and −14.67±0.7° respectively. In the mandibular arch, all teeth showed negative crown inclination. Among them, the first molar showed relatively higher negative crown inclination of −20.59±0.5° [Table 2]. The mean maxillary and mandibular tooth size ratios, overall and anterior, were similar to Bolton's ratios. The mean anterior ratio for female subjects was 77.26% (±0.162) and the overall ratio was 91.3% (±0.140). The anterior ratio for male subjects was 77.3% (±0.120) and overall ratio was 91.34% (±0.134). 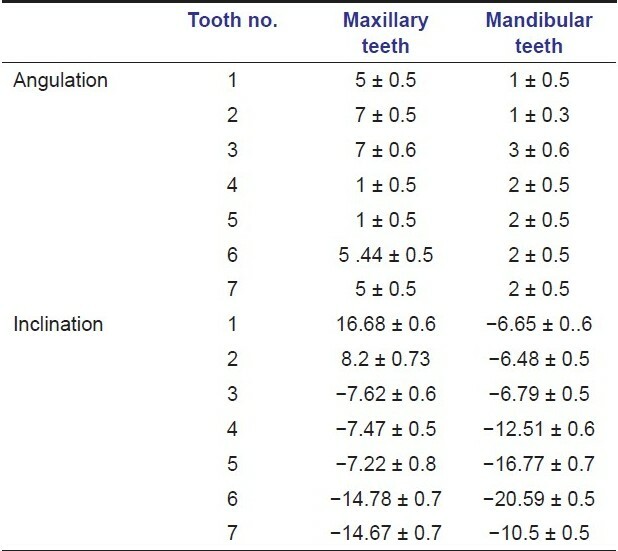 Seven subjects showed an overall maxillary excess of 0.5 mm [Table 3]. The normal values of crown angulation and crown inclination for the Davangere population, South India, are presented in [Table 4]. Normal occlusion is dependent upon proper distal crown angulation, especially for the upper anterior teeth since they have the longest crowns. The degree of incisor angulation determines the amount of mesio-distal space they consume and, therefore, has a considerable effect on posterior occlusion and anterior esthetics. In the current study, positive angulation values were obtained for all the maxillary teeth, similar to the values obtained by Andrews and in the study done by Currim and Wadkar  on an Indian population. The maxillary arch readings for crown angulations in the present study were 5°±0.5° for the central incisors, 7°±0.5° for lateral incisors, 7°±0.6° for canines, 1°±0.5° for first premolars and second premolars, 5.44°±0.5° for first molars, and 5°±0.5° for second molars. In comparison, Andrews' original findings had confirmed the angulations of 5° for central incisors, 9° for lateral incisors, 11° for canines, 2° for first and second premolars, and 5° for first and second molars. In the present study, the values of crown angulations of central incisors were same as that of Andrews. Whereas angulations value for lateral incisors, canines, and premolars were found to be lower than those of Andrews, while the values for molars are almost similar. The study by Currim and Wadkar  showed lower angulation values for central incisors, lateral incisors, canines, and molars (3.30°, 4.27°, 2.66° , 4.53°, and 3.0°, respectively) than our values. In contrast to the present study they observed higher values for premolars (2.6° and 5.07° for first and second premolars, respectively). In the mandibular dentition, positive angulations values were obtained for all teeth, comparable to the values obtained by Andrews. His original findings had confirmed an angulation of 2° for incisors, premolars, and molars, and 5° for canines. In the present study, crown angulation of 1°±0.5° for incisors, 3°±0.6° for canines, and 2°±0.5° for premolars and molars were found. The values obtained in the present study were lower than that of Andrews for incisors and canines, but the values for premolars and molars are similar. Currim and Wadkar  found negative angulations values for incisors (−0.23° and −0.43°), canines (−1.17°), and first premolar (−0.32°), which are in contrast to our findings. However, they observed positive angulations for second premolars (1.54°), first molars (1.67°), and second molars (2.12°), which were similar to our values. In the maxillary arch, we observed positive crown inclinations for central and lateral incisors, whereas there were negative crown inclinations for canines, premolars, and molars. This findings is similar to the study of Currim and Wadkar  where there was positive crown inclination of 5.80°±3.44 for central incisors and 4.44°±4.16° for lateral incisors, and negative inclination of −5.99°±5.82° for canines, −8.40°±5.24° for first premolars, −9.88 0±6.1° for second premolars, −11.27°±7.17° for first molars, and −9.95°±6.87° for second molars. Andrews'  original findings suggest an inclination of 7° for central incisors, 3° for lateral incisors, −7° for canines and first and second premolars, and −9° for first and second molars. In a study by Vardimon and Lambertz,  an inclination of 0.74°±4.45° for central incisors and −0.96°±5.16° for lateral incisors, and negative inclination of −8.39° for canines, −8.44° for premolars, −10.5° for first molars, and −9.28° for second molar in the upper teeth were seen. The result of present study found higher values of inclination for maxillary incisors than that found by Andrews,  Currim and Wadkar,  Vardimon and Lambertz,  and Morrow  (3.760° and 1.160° for central and lateral incisors, respectively). The inclination values for canines in our study are similar to those of Andrews  but higher than that of Currim and Wadkar. 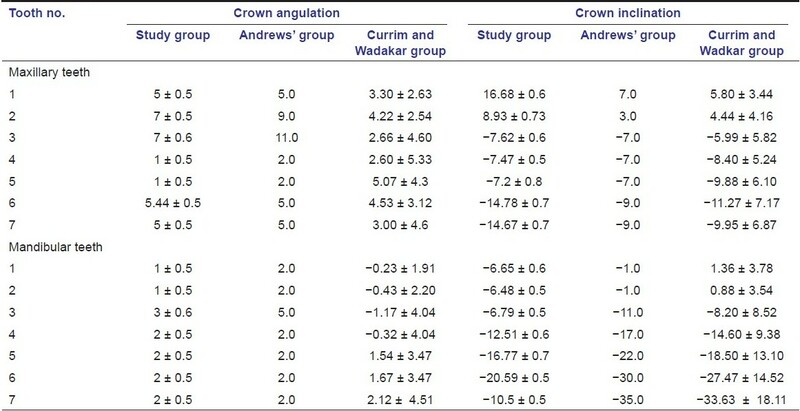 The crown inclination values obtained for premolars were similar to that of Andrews;  however, Currim and Wadkar  found higher negative values than our study. The present study also found increased negative crown inclination values for molars compared to that found by Andrews  and Currim and Wadkar. The study by Vardimon and Lambertz  showed lower values of crown inclination for central and lateral incisors when compared to the present study. Central incisors were upright and the lateral incisors showed negative crown inclination. Vardimon and Lambertz also obtained negative crown inclination from canines to second molars; however, the present study showed more negative crown inclination than their study. Morrow  found very low crown inclination values for maxillary central and lateral incisors (3.76° and 1.16°, respectively) than the present study. The values for the canines and premolars were found to be close to their values (−6.53° and −6.83°, respectively). The values for first (−6.86° ) and second molars(−2.22°) were less negative in their study than in the present study. In this study, the crown inclination of upper incisors was considerably higher than in all the other studies mentioned, with the difference between the crown inclination of the central and lateral incisors being almost double (16.68° vs 8.93°). These findings suggest that the crown inclination of maxillary incisors are more in this Davangere population. In the mandibular arch, the positive crown inclination obtained for the incisors was higher than that found by Andrews. Negative crown inclination values from the canine to the second molar, which progressively increased, was observed in the current study as in the Andrews study.­  Andrews found crown inclination values that were higher than our findings. In contrast to our study, Currim and Wadkar  found positive crown inclination for mandibular central and lateral incisors (1.36° and 0.88°,respectively). They observed a higher negative values for canines (−8.20°), first premolars (-14.6°), second premolars (−18.5°), first molars (−27.4°), and second molars (−33.6°). The results of the present study differ from the studies of Currim and Wadkar  and Andrews. Similar to Currim and Wadker,  but in contrast to our findings, Vardimon and Lambertz  found positive crown inclination for the central incisors (2.24°). The inclination values from the lateral incisor to the second molar were negative in these two studies , as well as in our study. However, we found that crown inclination values were much lower from the canine to the second molar. The crown inclination value of the second mandibular molar obtained in the present study differs from all the previous studies, ,,, by being much lower and not also by following the progressively increasing negative inclination from the canine to the second molar. Also, the lower incisors had a higher negative crown inclination than in other studies, ,,, which showed positive crown inclination for central incisors or mild negative crown inclination for both lower incisors. All these findings suggest that the lower incisors and second molars are more upright in this Davangere population. Specific dimensional relationships must exist between the maxillary and mandibular teeth to ensure proper inter-digitations, overbite, and overjet. Achieving a good functional occlusion with proper overbite and overjet requires that maxillary and mandibular teeth be proportional in size. Interarch tooth-size discrepancy hinders achievement of ideal occlusion. Proper relationships of the total mesio-distal width of the maxillary dentition to the mesio-distal width of the mandibular dentition will favor an optimal post-treatment occlusion. Due to this reason, the second objective of the present study was to find out the tooth size discrepancy in this population using Bolton's analysis. The present study showed values identical to that of Bolton's study  for anterior and overall ratio. But a few of the subjects showed 0.5-mm overall maxillary excess. This was an expected finding as only normal occlusions were chosen for this study and this finding is in accordance with the view that good occlusions do not have tooth size discrepancies. It also confirms that the sample chosen had good occlusion. Smith, Buschang, and Watanabe,  evaluated Bolton's interarch ratios in three population (i.e., Black, Hispanic, and White) and also evaluated the variation between genders. They found significantly different relationships between the lower and upper teeth. Also, significant gender differences were observed for the overall and posterior ratios but not for the anterior ratio. The anterior ratio (77.26%) evaluated in our study is lower than that found by Smith, Bushang, and Watanabe for all the three populations, but the overall ratio (91.34%) is higher in our study. No gender differences in overall and anterior ratios were observed in the present study, in contrast to their study. Similarly, Lavelle  showed that there was sexual dimorphism in tooth dimensions and in the ratio of upper and lower arch tooth sizes. He found that Blacks have larger overall and anterior ratios than Whites and Asians, although the actual differences were not tested and the arch segments responsible for the differences were not evaluated. He also showed that the overall and anterior ratios were consistently larger in males than in females, regardless of race, which finding differs from our study. The tooth size data reported by Moorrees et al. imply gender differences in the overall ratio, which disagrees with our findings. Stifter  replicated Bolton study in class I dentitions and reported similar results, which matches our study results. All maxillary and mandibular teeth showed positive crown angulation. Maxillary lateral incisors, canines, and premolars were less angulated. Mandibular incisors and canines were also less angulated. Maxillary incisors and molars were more inclined. Mandibular incisors were more inclined, whereas canine, premolar, and molar were less inclined. This study sample did not show any significant difference in the anterior and overall Bolton ratio. No sexual dimorphism in the overall and anterior Bolton ratios was seen. The results of the present study indicate that there are possible racial and ethnic factors contributing to the difference in crown angulations and crown inclinations. 1. Ugur T, Yukay F. Normal faciolingual inclinations of tooth crowns compared with treatment groups of standard and pretorqued brackets. AmJ Orthod Dentofacial Orthop 1997;112: 50-7. 2. Currim S, Wadkar PV. Objective assessment of occlusal and coronalcharacteristics of untreated normals: A measurement study. Am J Orthod Dentofacial Orthop 2004;125:582-8. 3. Andrews LF. The six keys to normal occlusion. Am J Orthod 1972;62:297-309. 4. Shellart WC, Lange DW, Kluemper GT, Hicks EP, Kalpan AL. Reliability of the Bolton tooth size analysis when compared to compared to crowded dentition. Angle Orthod 1995;65:327-34. 5. Creekmore TD, Kunik RL. Straight wire: the next generation. Am J Orthod Dentofacial Orthop 1993;104:8-20. 6. Bolton WA. Disharmonies in tooth size and its relation to the analysis andtreatment of malocclusion. Angle Orthod 1958;28:113-30. 7. Andrews LF. Straight wire- The concept and appliance. Los Angeles: 1 st ed Wells Company; 1989. 9. Marrow JB. The angular variability of the facial surfaces of the human dentition: an evaluation of the morphological assumptions implicit in the various 'Straight wire technique'. Thesis, St. Louis University, Missouri 1978. 10. Dewel BF. Clinical observations on the axial inclination of teeth. Am J Orthod 1949;35:98-115. 11. Smith SS, Buschang PH, Watanabe E. Interarch tooth size relationships of 3 populations: 'does Bolton's Analysis apply?' Am J Orthod Dentofacial Orthop 2000;117:169-74. 12. Lavelle CL. Maxillary and mandibular tooth size in different racial groups and in different occulasal categories. Am J Orthod 1972;61:29-37. 13. Moorrees CFA. The Aleut Dentition- a correlative study of dental characteristics in an Eskimoid people.. Cambridge, Mass; Harvard University press; 1957. 14. Stifter TA. A study of Pont's Howes', Rees', Neff's and Bolton's analysis on Class I Adult dentitions. Angle Orthod 1958;28:215-25.